Due to the untimely passing of Dave Willis, #ELTchat decided to pay tribute to him and to celebrate the work he did for the ELT community at large (as suggested by @eltexperiences). This applied to both discussions. @Shaunwilden told us that he started out in the PPP mode and coming across the TBL framework changed him as a teacher. I would like to echo this as it was the same for me. HanaTicha worried that it meant throwing away the PPP approach, which can still be a valuable resource, albeit with judicious use. @teflgeek wanted clarification: were we discussing TBL in its purist form, Coursebook TBL or teacher adapted TBL? He suggested that his own method closely approximated to TBPPP. Marisa_C asked whether anything remained in its ‘pure’ form these days. She said that TBL accepts a presentation (PPP) within the task cycle- if required. How is the second attempt at the task handled? This took up the majority of the first chat, as participants offered each other advice gained from their own experiences. MrChrisJWilson said that his students, particularly the teenagers, rolled their eyes and lacked motivation. He thought it could be a lack of awareness of deficiencies in the first draft. He explained that he used TBL mainly for writing tasks. michaelegriffin suggested a new partner and a bit of input or correction would help. teflgeek thought the problem might be caused by students being product focussed. He felt disappointed by the spoken output of his students, which he deemed ‘ephemeral’ as he believed that they focussed more on the answers than the developmental process. PatrickAndrews believed that this was actually what is contained in normal communication- for a product, through a process! teflgeek took issue with this and suggested that there might always be a purpose, but not always a product: transactional/interactional communication- which was disputed by MrChrisJWilson as being a false dichotomy as they overlap. And from a Literacy Teaching perspective? @JoHart explained that with adults, using TBL allowed them to draw on their own experiences or needs. She suggested using what the students need to achieve as the basis for a meaningful task. Has anyone tried using TBL in a BL Context? Marisa_C had experience and was happy to say that it worked well in blended learning mode, especially if you had groups in breakout rooms. Others agreed that TBL lent itself to an online environment. HanaTicha asked her students to make their own videos and discuss the steps in a Facebook group. pjgallantry had experimented with Moodle with his ESOL students. It depends how tech-savvy the students are, and how the lessons are set up, according to him. Marisa_C was interested to find out whether the synchronous environment, in real time, made TBL easier to implement. pjgallantry suggested that Blended Learning was often about the task, but not necessarily the complete cycle. Some online courses, such as the OU’s EAP course, have a clear task based focus. Is the Flipped Class the New TBL? The Flipped Class model, where the task is largely done in class, allowing for differentiation, would relate BL to TBL, according to pjgallantry. In answer to Shaunwilden, he suggested that it tends to lead to a cyclical module design when used with TBL. He explained that he had designed a BL ESOL course as part of his DELTA mod3 which used TBL as its core. Shaunwilden agreed that the cyclical nature of both was evident. So it can be said that both f2f and online tasks are able to use the TBL core; it depends on the tools and the tasks. Can Course or Resource books provide material? pjgallantry: TBL is largely tailored because of its nature. This comment was met by: does that put TBL out of reach for busy teachers constrained by coursebooks? @teflgeek. Marisa_C suggested that reversing the order of things in the coursebook could provide a challenge, and this was agreed later by @Shaunwilden. @jospa74 : My problem with TBL is the lack of resources. Penny Ur’s book ‘Discussions that work’ was suggested as a good source of material, which could be used for speaking and writing lessons as well as the full TBL cycle. There was a rolling of the eyes from Shaunwilden when the Zoo Activity was mentioned- not because it is bad material- perhaps just a trifle overusedJ. I like the book because the tasks can be used with mixed level or ability classes and can be tailored to their needs. I also like a very old book which has a few excellent tasks called ‘Ideas for Listening and Speaking’. Of course, as Shaunwilden said, it isn’t the book/ material you use, it is the framework you use it in. pjgallantry asked whether anyone had taken coursebook materials and recast them in a TBL framework. Shaunwilden suggested doing the activities in reverse if the material is too PPP. Josipa74 used the key expressions parts of Business Result with speaking practice in ‘real’ situations. Marisa_C suggested that most CB follow-up activities don’t actually sit well with the TBL cycle. She thought that the main problem was that coursebooks usually have structural, rather than task syllabuses. She did mention, though, that there was definitely materials design in TBL which could be found in good ESP and Business English materials. I suggested ‘Cutting Edge’ as a book with a task based edge and was shot down in flames. Shaunwilden proposed that it was actually quite traditional up to the task activities. I was delighted to hear from @stephenburrows who told us that he had been trained by D and J Willis themselves (lucky!). They said that Cutting edge had been designed to be 100% TBL, but, due to feedback from teachers and publishers, it was necessary to add more PPP grammar elements to ensure that it would sell. Comments were made to the effect that it always comes down to money! A tricky question to answer and @theteacherjames asked for time to think about an answer. HanaTicha thought that tasks are culture based. I suggested that tasks offered real time language opportunities and often solve problems. pjgallantry wondered whether a task was the same as a problem. Josipa74: tasks need to be lazy-student proof, in discrete stages, to prevent students finding ways to take the line of least resistance. So, a definition- and what about the linguistic element? stephenburrows: The key is the focus on Meaning over Form. It’s a communicative approach, with a goal, which makes the difference. But the language shouldn’t be forgotten. Marisa_C: So it seems like a task must be challenging, involve decision making and have some linguistic outcome. @sbrowntweets: I would say that a task has to have a NON-linguistic outcome; otherwise it’s just a language activity. The main aim is to produce something other than language. @rapple18 was in agreement on this point. Josipa74: shouldn’t it be something that native speakers do? And that has many possible outcomes? For a task to be challenging to all students, it would be best to give students different approaches to the same task, according to pjgallantry. Marisa_C agreed that the task needed to be achievable, yet involve a degree of challenge where students would need to pool their linguistic resources - and the task could then create a need for new language. stephenburrows concurred and pointed out that this met the requirements of the Model stage; to feed in new language, which is subsequently reflected on after the learners try to use it. This is different from a simple revision of known areas. He said that a task without a Model stage failed to demonstrate new linguistic possibilities. pjgallantry thought that students actually required evidence of what the linguistic outcome was or they became frustrated. @MarjorieRosenbe gave us a tangible example of how that works in a Business English context, where students need to work out the answer to a given situation. She suggested that her students often become involved in the task and the language might easily take a backseat. Josipa74 told us about the time she had her class make Ginger Beer over a period of three days. This was a practical lesson, which I’m sure will be remembered- even if there didn’t appear to be much of a linguistic outcome. But how do you keep the students on track-and using the target language? Personally, I find that monolingual groups are quick to revert to their L1 if not motivated to speak in English. As most of my classes are mixed nationality it isn’t too much of a problem for me, and I don’t really mind, as long as the end result is done in English, as required. This struck a chord with some of the other participants, who suggested that the teacher needs to take on the role of police/ monitor, which is a criticism of TBL. MarjorieRosenbe and stephenburrows appeared to think that this was not likely if the task was in the target language. HanaTicha thought that given the chance, most students would use L2. At the other end of the cycle- do you use task repletion or a further, more challenging task? Nearly everyone was in agreement here. Stephenburrows: task repetition is vital- communicative task-delayed error correction- feedback- task………. Shaunwilden: It depends on how they fared during the earlier parts of the cycle. I had such an interesting time while writing this, that I tried out a TBL session with my mixed level PM class today. It went extremely well and I would like to thank everyone for their contribution. 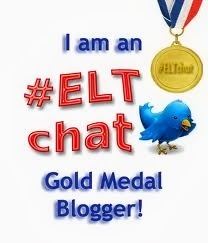 Our newest member, @melody_philip, taking part in #ELTChat for the first time, finished by saying: I’ve learnt a lot. Thank you everyone.